Have you ever had a glass of wine with friends and before you know it, you have a perfectly empty wine bottle sitting in the recycling? Well now you can turn that fine glass into a piece of home décor. Not only will you be adding a pop of color to your place, but your wallet will thank you later. First, you’ll need to remove those pesky wine labels by soaking your wine bottle in hot water. Completely submerge the bottle and let it sit for about 10 minutes. You’re then ready to peel off the labels. 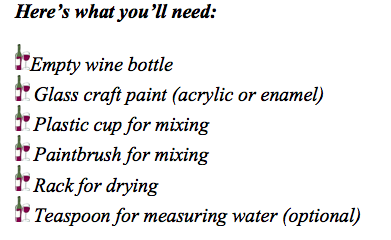 While you wait for the wine bottle to dry you can start mixing your paint with water. Mix ¼ cup of your paint with about a teaspoon of water. Mixing the paint and water will thin out the paint, allowing it to move around the bottle much easier. Pour the paint into the bottle and tilt back and forth until the bottle is completely concealed. Place the bottle upside down on a rack to ensure all the excess paint drips out; let it dry overnight. Once it’s completely dry it’s now ready to decorate! You can use it as a vase or decorate the outside to add extra texture. Until the next craft. Cheers!